"This recipe is a family tradition. It has been handed down from generation to generation but never written down. There are things I'd like to explain before starting: some of the meats I use are interchangeable. The whole idea of a meat gravy is the different combination of meats, not the exact meats themselves. The two basic meats are pork and beef; some like to add veal, but I don't. Many in my family add their own third meat: some use poultry, mine is lamb. Some in our family only use beef and pork but I find it less tasty. 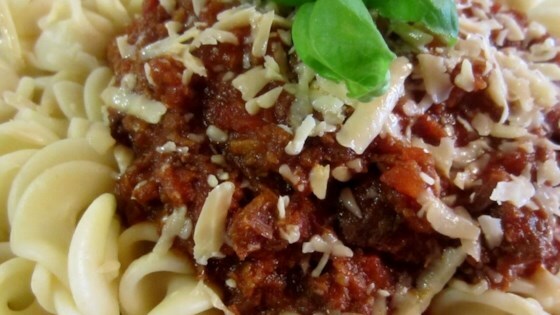 Serve the sauce over your favorite pasta with grated cheese; I recommend Locatelli® Pecorino Romano. I also add meatballs and braciole to the sauce; see links below for those recipes." Heat the olive oil in a large pot over medium-low heat. Place the pork shoulder in the center of the pot and arrange 4 or 5 garlic cloves around the sides of the pan. Brown the pork roast on all sides and transfer to a large baking dish; remove garlic cloves from pot with a slotted spoon and transfer to a bowl. Repeat the process, browning pork spareribs, oxtails, and lamb shank, adding about 4 cloves of cracked garlic with each batch of meat, and transferring meats to the baking dish. Transfer each batch of garlic cloves to the bowl when cooked. Cook the sausage in the olive oil in the same pot over medium heat until browned, breaking it up with a wooden spoon as it cooks, until no longer pink, 10 to 12 minutes. Transfer the cooked sausage to a large bowl and refrigerate while you complete the next steps. When all of the sausage is browned, return the reserved garlic cloves to the pot and stir in tomato paste, salt, black pepper, and red pepper flakes. Stir the tomato paste with a wooden spoon, scraping up the browned bits of meat in the pot. There will be a buildup of juices in the baking dish where the meats are resting; pour this liquid into the pot. Add the Burgundy wine and cook, stirring occasionally, until most of the liquid has evaporated, about 15 minutes. Remove the pork shoulder, pork spareribs, oxtails, and lamb shank. When cool enough to handle, remove the meat from the bones and finely chop it. Return meats to the pot of sauce and discard the bones. Stir the cooked sausage into the sauce; simmer for an additional 1 hour. Taste the sauce and adjust the seasonings. The amount of servings is an approximation. Of course you don't have to make this in such a large amount. I make such a large quantity so that I can put it into smaller containers and freeze it. If the tomatoes you use contain puree, you should reduce the amount of tomato paste by half. You can use pork knuckles for the pork spareribs, and beef short ribs instead of the oxtails. Use all sweet Italian sausage instead of half sweet, half spicy, if you prefer. I prepare meatball mixture first and put the mixture in the refrigerator until it's time to roll and fry them, to allow the flavors to marry. Don't fry them until the sauce is cooking. When finished frying, deglaze the frying pan lightly with some sauce and return the sauce to the pot. See my recipe for Bon Appetit's Meatballs. I make my Braciole with beef and pork wrapped around Genoa salami. Add them about two hours into the cooking time (see Step 6) so that they'll have about 2 to 4 hours of simmering time. Before serving, slice the braciole and remove the kitchen twine. This is fabulous. It's worth the time to make. True rich flavor!!!! Yumm, worth the steps, and the brown bits after each searing makes it even better! Thanks for sharing. Delicious! Made this for the first time to try Laura Vitale's Pasta al Forno (Baked Ziti). I can imagine how versatile this is going to be in many other recipes. Thanks for posting! I made no changes, the gravy was fabulous!!!!!!!!!!!!!!!!!!!!!!! !